Organizers for Chicago’s Spring Awakening Music Festival — now in its third year — today revealed the lineup for the June 13-15 festival at Soldier Field. Topping the list of performers set to perform over the three days are Tiesto, Pretty Lights, Chicago native Kaskade, Knife Party, Diplo, Big Gigantic, Benny Benassi, Bingo Players, Dillon Francis, Eric Prydz, and Flux Pavilion. 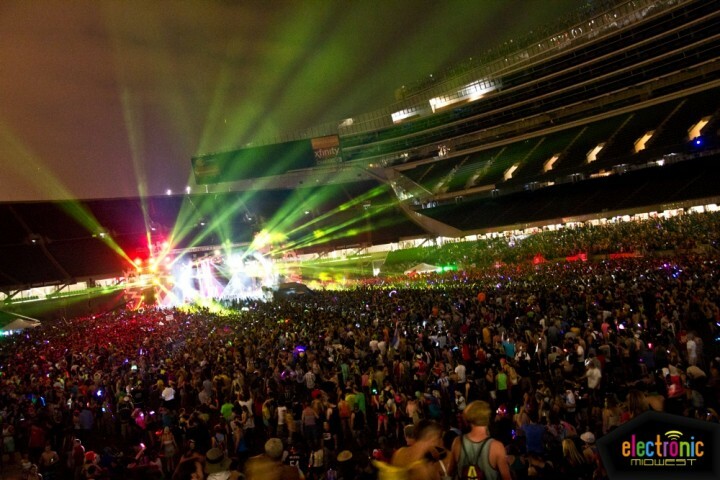 Artists will perform across four stages throughout the Soldier field complex. New this year is the addition of a second main stage. Other performers in today’s announcement include 3LAU, Alex Metric, Alvin Risk, Andy C, Arty, A-Trak, Blasterjaxx, Borgore, Caked Up, Candyland, Carnage, Chuckie, Claude VonStroke, Datsik, Derrick Carter, Destroid, DVBBS, Dyro, Feed Me, Ferry Corsten, gLAdiator, Green Velvet, Gregori Klosman, Kap Slap, Kill Paris, Kill the Noise, Laidback Luke, Manic Focus, Markus Schulz, Midnight Conspiracy, Nervo, Nick Catchdubs, Oliver, Ookay, Paper Diamond, Pete Tong, Sander van Doorn, Sandro Silva, DJ Snake, Thomas Gold, Tommy Trash, and more. After a successful launch in 2012, the festival expanded to three days last year and attracted over 30,000 fans daily. 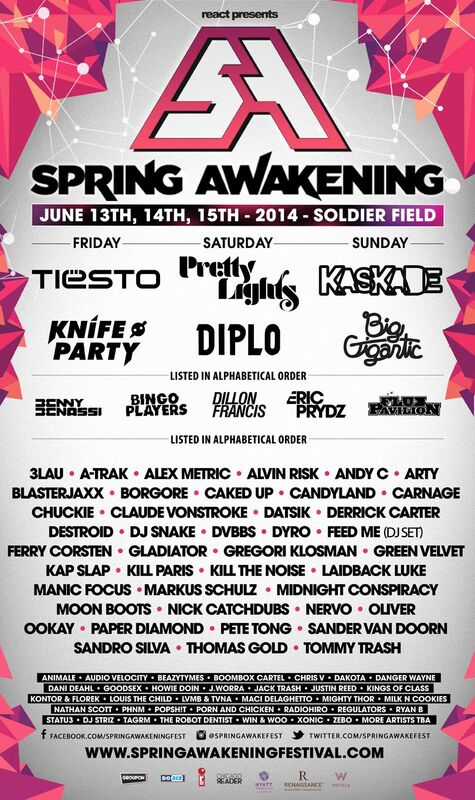 Spring Awakening is one of the few remaining all ages festivals. Tickets are on sale now via Ticketmaster. Three-day GA passes start at $169 plus taxes and fees. VIP tickets start at $299.